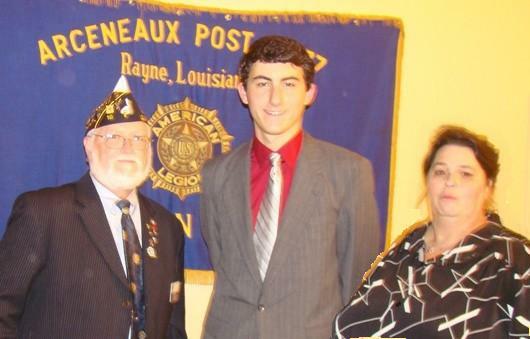 Pictured from left to right: Terry Sharp – 6th District Commander, Stephen Johnson – winner of the Oratorical Contest, Barbara LeJeune – 6th District President. The finals for the State Oratorical were held on Sunday, February 15, 2009 at Post/Unit 77 in Rayne, Louisiana. Winner of the Oratorical was home-schooled student, Stephen Johnson from Tangipahoa Parish in the 6th District.